Pathfinder. The canoe shot into the bushes, Mabel was hurried to land by Jasper, and all three were safe. Not so with Pathfinder. By helping his friends, he had brought himself into a situation of great danger. The force of the river at that particular point was very strong. He was alone in the light canoe and was slowly being drawn downstream. Although he soon reached the center of the river, his position was now directly opposite the two Indians who stood in the water. Bullets flew around him on all sides. The Indians on the shore had also rushed back along the bank and joined their friends. Pathfinder knew that the only hope of saving himself was to keep moving, since any change of position would naturally make the aim of the enemy more difficult. But movement in a single direction was not enough, for the Indians, like all trained hunters of running animals, well knew how to fix the fine of their aim. He was therefore forced to keep changing the course of his canoe—at one moment shooting down the river with the speed of an arrow, and the next, turning quickly in the direction of the opposite bank. Fortunately, the Indians standing in the water were not able to load their rifles again. The bushes which lined the shore also made it difficult for those still on the bank to keep Pathfinder continuously in view while shooting at him. He was moving successfully downstream when a new danger—though not an unexpected one—suddenly presented itself. The party of Indians that had been left below for the purpose of watching the river now came into view. These were the savages who had been mentioned in the con­versation between the Indians standing in the water and those on the bank. They were no less than ten in number. Understand­ing the advantages of their position, they had placed themselves at a spot where the river moved with great speed over a series of rocks. The current was naturally strong at this point, because of the rocks, and it also turned sharply in the direction of the east shore, where they waited. Pathfinder saw that if he entered this section of the river, he would have to pass directly under the rifles of this new enemy. He therefore tried with all his strength to reach the west, or opposite shore. But the force of the current continued to pull him nearer to the point of danger. His situation was now more serious than ever. There was only one course open to him now. Taking his rifle and extra ammuni­tion in hand, he jumped into the water and began to swim; and where the water was less deep, to walk from rock to rock, in the direction of the west shore. The canoe swung madly about in the angry current, now rolling over on one side, and now on the other; now filling with water, and again clearing itself. At last it came to rest on the shore, not far from the spot where the Indians had taken their position. Pathfinder was as yet far from being out of danger. For a minute the admiration which even the enemy felt for his cour­age and daring kept them from doing anything. But soon one rifle after the other rang out, and bullets began to fly around his head and shoulders. Several times his clothes were cut and marked, but he himself remained untouched. Since Pathfinder had to walk much of the distance in water which rose nearly to his arms, while he kept his rifle and ammu­nition raised above the current, he soon grew very tired. He was therefore glad to stop near a large rock which rose so high above the river that its upper surface was completely dry. He placed his rifle and ammunition on top of this rock, then he himself got behind it, so as to have the advantage of its cover. The west shore was only fifty feet away, but the dark, fast-moving current that lay between him and the shore made further walking impossible. This final distance, he knew, he would have to swim. “Pathfinder,” called a voice from among the bushes, at a point on the west shore just opposite where Pathfinder waited. A. 1. What did Pathfinder tell J asper to do? 2. How did J asper show that he understood? 3. Why was Pathfinder in great danger? 4. Why did Pathfinder know that he had to keep moving? 5. Why was he fortunate? 6. What new danger presented itself? 7. Where had the other group of Indians placed themselves? How many of them were there? 8. Why couldn’t Pathfinder reach the west shore? 9. What did Pathfinder do to save himself? 10. What happened to his canoe? 11. Why didn’t the Indians do anything for a minute? 12. What did the Indians soon begin to do? 13. Why did Pathfinder grow very tired? 14. Where did he stop? How would he have to reach the op­posite shore? 15. What did J asper advise Pathfinder to do? 16. Why didn’t Pathfinder want to leave his rifle behind? “Mabel will find me between her and her enemies,” said Jasper calmly. Sure enough, the Indians had decided on crossing the river. Since Pathfinder and his friends now kept themselves completely hidden, their enemies must have thought they had run away. Such a course was that which perhaps most men would have followed. But Mabel was under the care of those whose skill in Indian fighting was great, and who well knew that they must protect the only pass that offered them any chance of escape. As Pathfinder had said, three Indians were in the canoe. Two sat with their deadly rifles across their knees, ready at a moment’s notice to fire; the third stood in the back, using the paddle and steering the canoe. They had first taken care to pull the canoe, before entering it, so far up the stream as to have reached the still water above the rocks. It was seen that the savage who guided the boat was well experienced, for the long, steady stroke of his paddle sent the light boat flying along the surface of the river. “Shall I fire?” asked Jasper in a whisper, greatly excited. Jasper’s concern for Mabel remained unexpressed. At that moment the sharp report of a rifle was heard, and the Indian in the back of the boat fell over dead into the water, still holding his paddle in his hand. A small circle of smoke floated out from among the bushes on the east shore and then disappeared into the air. “But are we strong enough to keep them from crossing?” asked Jasper. While Jasper was speaking, the floating branch came into sight and, carried along by the fast-moving current, came straight toward Pathfinder. He gave the signal to Cap, and within a few minutes the canoe followed. Pathfinder took hold of the canoe as it floated by and swung himself over its side. Then, with a strong push, he sent it moving rapidly toward the shore, where Jasper waited. There the two friends made fast the canoe within the cover, and then shook hands warmly, like those who have just met after being separated a long time. “That is the Serpent who has spoken,” cried the Pathfinder. The canoe had no sooner lost its guide than it floated with the stream and was pulled by the current in the direction of the rocks. The two remaining savages looked wildly about them, but could do nothing against the power of the current. It was perhaps fortunate for Chingachgook that the attention of the Iroquois was given completely to their situation in the canoe, otherwise, his position would have been one of great danger. The enemy made no move. In less time than it takes to tell, the canoe went swinging about in the current, while the two savages stretched themselves out in the bottom, as the only means of keeping it from turning over. Even this plan failed them. Striking a rock, the light boat rolled over, and the two Iroquois were thrown into the water. The water is seldom deep among such rocks, so there was little fear of their drowning, but they lost their rifles and at once, partly swimming and partly walking in the water, began to make their way toward their own friendly shore. The canoe had landed on a rock in the center of the river, where for the moment it was of little use to anyone. So excited had the young man become by what had just taken place, that the bullet sped from his rifle as he spoke. Yet his aim was wide of the mark, and the two Indians continued walking calmly toward the other shore. A. 1. What did Pathfinder call his rifle? 2.Why did he think they could keep the Indians from crossing the river? 3.Why had Cap sent a branch down the river? Did it pass near Pathfinder? 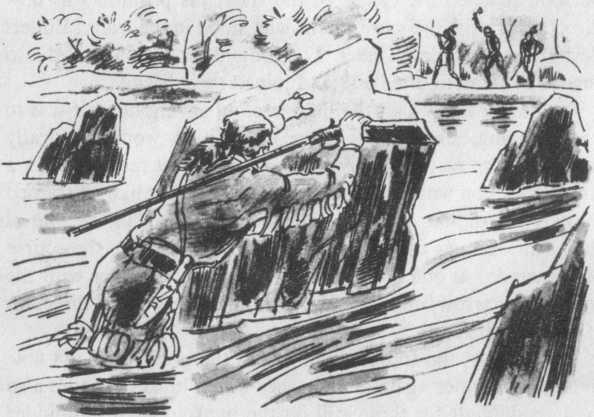 4.How did Pathfinder escape from the river? 5.Why did the Indians now think that it was safe to try to cross the river? 6.How many Indians were there in the canoe? How many of them had rifles? 7.Why did Pathfinder tell Jaspet not to fire yet? 8..What happened to the Indian in the back of the canoe? 10.What happened to the canoe? 11.What happened to the two Indians? 12.Why did Pathfinder think that Chingachgook had been foolish?